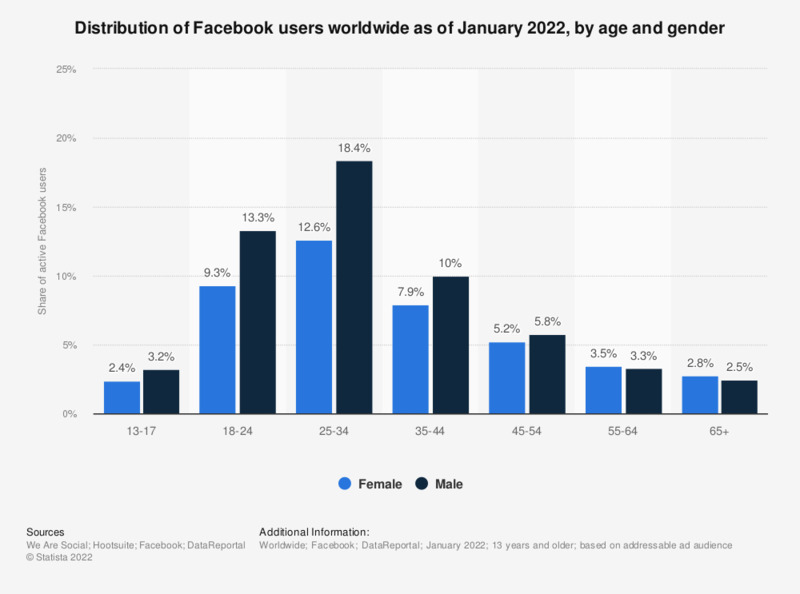 As of April 2019, it was found that ten percent of global active Facebook users were women between the ages of 18 and 24 years, and male users between the ages of 25 and 34 years constituted the biggest demographic group of Facebook users. Founded in 2004 and going public in 2012, Facebook is one of the biggest internet companies in the world with influence that goes beyond social media. It is widely considered as one of the Big Four tech companies, along with Google, Apple, and Amazon (all together known under the acronym GAFA). Facebook is the most popular social network worldwide and the company also owns three other billion-user properties: mobile messaging apps WhatsApp and Facebook Messenger, as well as photo-sharing app Instagram. The vast majority of Facebook users connect to the social network via mobile devices. This is unsurprising, as Facebook has many users in mobile-first online markets. Currently, India is ranked first in terms of Facebook audience size with 260 million users. The United States, Brazil, and Indonesia also all have more than 100 million Facebook users each. Values may not sum up to 100 percent due to rounding.